No one ever claimed Judy Garland’s death started the 1969 Stonewall Riots that historians credit with launching the modern gay rights movement. But Judy’s presence looms over those riots like Glinda the Good Witch from the “Wizard of Oz”. Judy is the Fairy Godmother of the gay rights movement largely due to her string of celebrated concert tours throughout the fifties and sixties – performing to sold-out houses wherever she went. Judy’s pill addiction kept her out of the movies, but she found great success on the stage, becoming one of the most popular and highest paid live entertainers of the 1960’s. Judy was a survivor and other survivors responded to her. People would read about Judy’s latest troubles in the newspapers and the next week she’d be wowing them at the Palace. Her live performances were legendary and at these shows, closeted homosexuals saw each other in DROVES and realized, perhaps for the first time, that they weren’t alone – that there was such a thing as a gay identity. With being gay practically illegal nationwide, it must have been quite liberating to see Judy and as a bonus find out you were part of a bigger family – that there was a rainbow you could get over. I know this sensation first hand, because I felt this same thing when I was a teenager in Ohio going to my first Liza Minnelli concert. I’d never seen so many gay guys in my life! 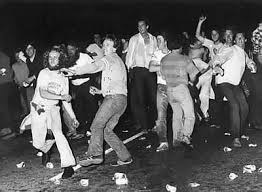 The rush I felt at the recognition that I could be myself for the next two hours – that I was with family – that was beautiful for me and it must have been even more beautiful for guys in the straight laced 1960’s. This highly visible gay presence at Garland’s concerts did not escape the attention of the national press, including a high profile article in Time magazine that made horrible, stereotypical fun of Judy’s loyal gay audience. 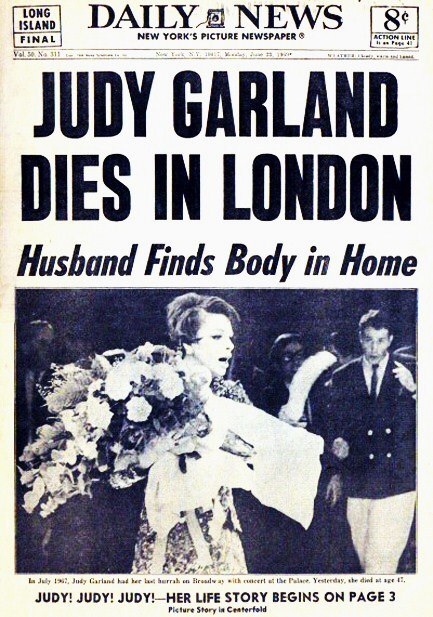 From Wikipedia: Time magazine reviewed Garland’s 1967 Palace Theatre engagement in New York City, and wrote that a “disproportionate part of her nightly claque seems to be homosexual.” The review goes on to say that “[t]he boys in the tight trousers” (a phrase Time repeatedly used to describe gay men) would “roll their eyes, tear at their hair and practically levitate from their seats” during Garland’s performances. The attached clip below is from an interview Garland did in Chicago while on her 1967 tour (interviewed by Irv “Kup” Kupcinet) where towards the end she is asked about the above mentioned Time article that cast aspersions on her fans and her “homosexual audience” and Judy angrily defends her fans, and casts some shade on the writer. 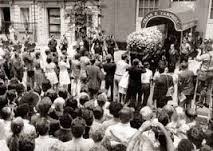 So, Judy didn’t start the Stonewall Riots, but her public funeral in Manhattan the very day (and night) of the riots helped fill the Stonewall Inn, when a portion of the over 40,000 fans who filed by Judy Garland’s open casket later went down the street to have a drink in her memory at the only real gay bar in town – the Stonewall Inn. What a fascinating piece of history!